Project requirements are collected in this activity. This framework activity is the main focus of the project managers and stakeholders. This framework activity includes communication and coordination with the clients. This framework action incorporates data about the technical work to be planned, risks to be faced, resources needed for task completion, the decision of the milestone deadline to release the product in production. 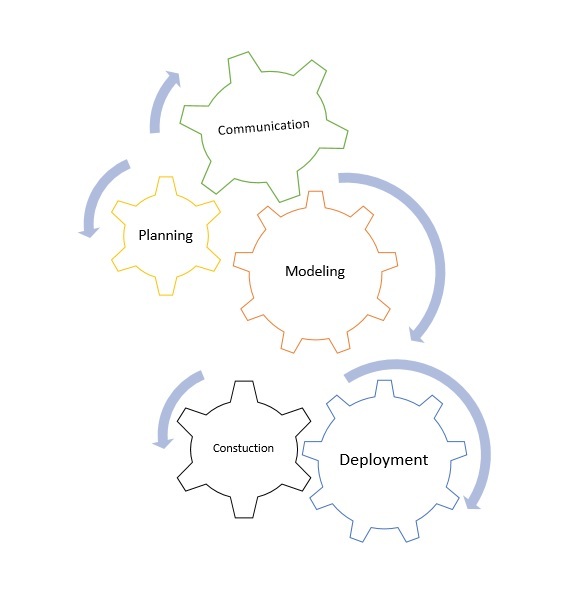 This framework phase includes the creation of product models by analyzing requirements and designing flowcharts and use cases which make developers and customers get a better understanding of the software functionalities that will achieve all requirements. In this framework activity, the actual development of the product begins with code construction and then testing to fix errors and issues. In this framework phase, product prototypes are delivered or the completed software is delivered to the users. Feedback is obtained for getting delivered software’s evaluation to add new features or future needs of the software. Next Post Why is it so important to review every framework activities?